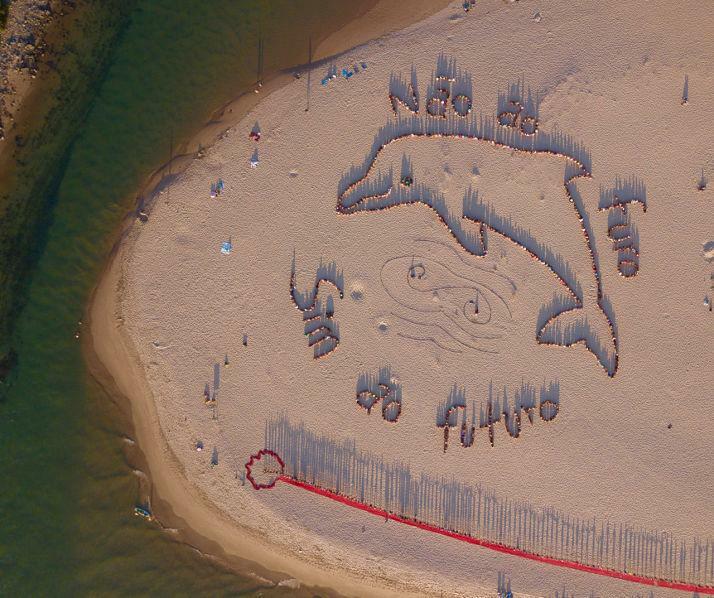 Nearly 1000 people, including activists from 40 countries from around the world, local residents and beachgoers, came together to create an iconic image of a dolphin in the sand in solidarity against the planned oil drilling off the Portuguese coast. Drawing a red line where the beach meets the ocean to represent the voices of those saying “no”. At a time when wildfires rage across Portugal destroying close to 30,000 hectares of land in the past week alone, and around 80% of the country is suffering from "severe" or "extreme" drought conditions, this powerful combination of prayer, art and political action is a clear and unified message that water is life, water is sacred, life is sacred, and we must defend the sacred. Environmental activist groups ASMAA, ALA and Climaximo, as well as the municipalities of Aljezur and Odemira joined the action, which is part of “Defend the Sacred: Envision a Global Alternative," an international gathering taking place in Tamera from 7–16 August 2017, focusing on reconciling indigenous wisdom with futuristic thinking to find a shared vision for a regenerative global culture. Opening the speeches, Laurinda Seabra, leader of environmental activist group Algarve Surf and Marine Activities Association, ASMAA said: “Between April and June 2018, Galp and Eni have threatened to drill offshore … from this beach you would be able to see the platforms. What we’re doing is to protect our oceans, protect our waters, protect our lands, and protect our earth." Martin Winiecki, leader of the Institute for Global Peace Work at Tamera and host of the gathering says: "We dedicate this action to system change from a culture of exploitation to cooperation with all that lives. We also take a stance towards the fires currently raging in Portugal and around the world. Those fires resulting from mismanagement of forests and water and eucalyptus monocultures are fuelled by the very same system of short-term profit that is pushing to drill for oil off this coast." The action was designed by John Quigley, an American environmental advocate, known around the world for his aerial art activism. John says: “Today the movement grows … we will demonstrate it on this beach; all of these families that came and thought they were going to play with their children today are going to become activists to save this beach.” Using their bodies to draw a huge message on the ground, the people created a large dolphin in the sand and the messages “Não ao Furo, Sim ao Futuro” (“No to Drilling, Yes to the Future”) and “Defend the Sacred”. The message featured the “Linha Vermelha” (“Red Line”) – a campaign created by Climaximo and the Citizenship Academy. The red line represents the voices of those who repeatedly say "no" to the oil drilling here and in the world, and through weaving and knitting, aim to inform and mobilize the population, who otherwise would not be aware and sensitized to this crime. Leading the prayers to lead the people into the art were Sabine Lichtenfels, co-founder of Tamera, and LaDonna Brave Bull Allard, founder of the first resistance camp against the Dakota Access Pipeline protests and the Standing Rock movement in the United States last year. LaDonna Brave Bull Allard said: “I know that as we stood that the world stood with us, and so I came here to stand with you … We have no choice anymore, we must stand up for the water and we must stand up now ... So I stand with the fire, praying that everybody’s heart and mind ignites to stand together in prayer to make a better life.” Tamera is a holistic peace research and education center that has 40 years of research in building sustainable communities of trust. They are world-renowned for their Water Retention Landscapes and work towards decentralized regional autonomy through solar energy, water retention, ecosystem restoration and food sovereignty. They’ve been educating global changemakers and activists for 15 years and supporting a number of peace initiatives around the world.